Soothe nasal problems with our great range of wholesale nasal care products. Get 10% off your first order! Colds and flu aren't just a winter problem, make sure you've got a good selection of nasal care products in stock to cater for your customers needs. There’s nothing more annoying than a blocked, stuffy nose caused by the common cold, hayfever or sinusitis, which is why as a leading supplier of GSL medicines Harrisons Direct stock a selection of wholesale nasal care products to help your customers fight the sniffles. Easy to apply and incredibly effective Vapour Rub from Bells and C.M.S is one of the oldest nasal remedies on the market! The strong fumes loosen phlegm and mucus helping to unclog sinuses and make breathing easier. Easy Breathers are easy to use dry tissues that release a soothing vapour to fight nasal congestion. Made using a selection of natural ingredients wholesale Easy Breathers are fast acting, suitable for use all year round and are free from messy oils or rubs. 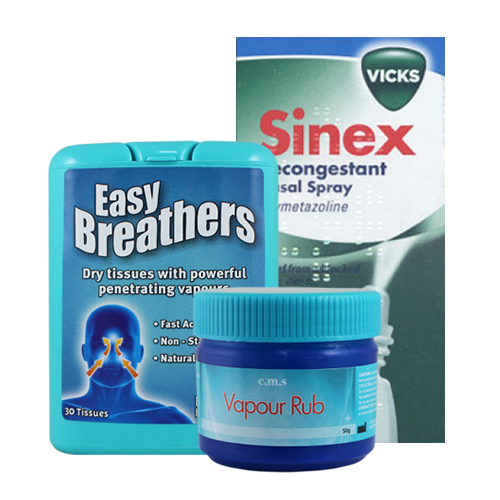 Wholesale Vicks Sinex Decongestant Nasal Spray provides instant relief of the symptoms associated with a blocked nose and lasts for 6-8 hours, allowing users to get on with their day. This specially formulated wholesale nasal medicine contains the active substance oxymetazoline hydrochloride, which effectively blasts nasal congestion. Here at Harrisons Direct we specialise in supplying GSL medicines and wholesale nasal care to customers across the UK. With almost 100 years experience in the wholesale industry we pride ourselves on offering exceptional customer care alongside a timely and reliable delivery service.